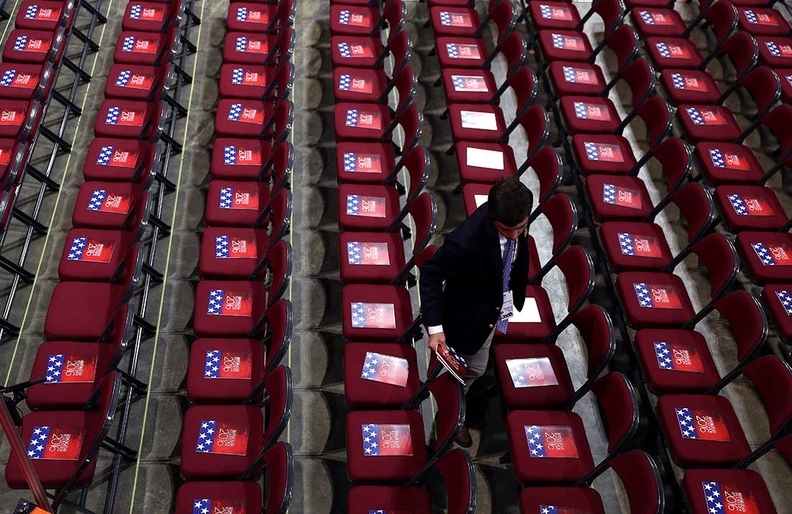 Booklets are placed on chairs as the Quicken Loans Arena is prepared for delegates on the first day of the Republican National Convention on July 18 in Cleveland. No sooner than I had filed a blog post late Monday afternoon asking when the Republican Party planned to release its overdue 2016 policy platform, lo and behold it appeared, a couple hours before the GOP national convention opened. Veteran policy watchers said it arrived unusually late, probably because of internal debates. And guess what? The Paul Ryan wing of the party mostly carried the day, getting its conservative health policy proposals into the platform. The platform statement, which will be voted on by delegates at the convention, left no trace of presumptive presidential nominee Donald Trump's repeated campaign statements about not touching Medicare, Medicaid, and Social Security and making sure all Americans have healthcare when they need it. And despite Trump's statements about letting Medicare negotiate prices with pharmaceutical companies, there is no discussion about how to control soaring prescription drug costs. The platform promises that on the first day in office, a Republican president will use “legitimate waiver authority” to “halt” the “advance” of the Affordable Care Act, and then, with the unanimous support of congressional Republicans, sign its repeal. But the platform makes no mention of what Republicans would replace it with to help consumers afford health insurance. In addition, legal experts say there is no waiver authority in the law that would allow a president to block enforcement of the ACA. The omission of a premium subsidy mechanism is a surprise, given that the recent House Republican leadership white paper spearheaded by Ryan called for refundable tax credits to everyone who does not have employer-based or other coverage. The absence of discussion of subsidies may signal that GOP leaders could not convince the most conservative members of their caucus to agree to any federal spending to subsidize coverage, or else Republicans could not agree on how to pay for those subsidies. There had been skepticism about whether the Trump campaign would accept the House GOP plan to turn Medicare into a defined-contribution program and raise the eligibility age to 67. Those provisions would potentially expose future retirees to higher out-of-pocket costs and give Democrats powerful attack material for riling up older voters. During the primaries, Trump repeatedly criticized Ryan's past efforts to restructure and cut Medicare, Medicaid, and Social Security, and blamed Ryan's proposals for Mitt Romney's loss in the 2012 presidential election. But there it is in the new platform. The language calls for shifting Medicare to a “premium support model.” It would give Americans under 55 an “income-adjusted contribution toward a plan of their choice, with catastrophic protection,” which people could apply either to traditional Medicare or the new privatized program. This would strengthen patient choice, promote cost-saving competition among providers, and guard against fraud and abuse, the platform says. And without mentioning a specific age, the platform also proposes to “set a more realistic age for (Medicare) eligibility in light of today’s longer life span.” It does not acknowledge that there is a growing disparity between the longevity of wealthier and less affluent Americans, with a sharp increase in mortality for middle-aged white men with less education. Political observers say including this controversial Medicare restructuring proposal in the platform and campaigning on it is politically risky for Republicans. It remains to be seen whether Trump will talk about it—though Hillary Clinton and other Democratic candidates surely will mention it prominently. “Ryan's Medicare voucher plan has been shown to be extremely unpopular in polls among people age 50 and older,” said Robert Blendon, a professor of health policy and political analysis at the Harvard School of Public Health. Less surprising is that the GOP platform calls for turning Medicaid into a capped state block grant program, with enormous freedom for governors and state lawmakers to set eligibility, benefits, and program design. Both the House leadership proposal and the Trump campaign's seven-point health proposal favored block-granting Medicaid. “Using block grants would allow states to experiment with different systems to address mental health and develop successful models to be replicated in states across the nation,” the platform says. Despite Trump's promises to leave Social Security unchanged and protect it from cuts, the platform language suggests support for Ryan's proposed privatization of Social Security, though it didn't offer details. “As Republicans, we… believe in the power of markets to create wealth and to help secure the future of our Social Security system,” it said. The platform also included a number of perennial conservative health policy favorites, including reducing state insurance benefit mandates, capping non-economic damages in medical malpractice suits, allowing consumers to buy insurance across state lines, letting businesses band together to buy coverage, and expanding health savings accounts. It says individuals with preexisting medical conditions who maintain continuous coverage should be protected from discrimination by insurers but it doesn't offer details of how this would be done. Overall, the platform lays out standard conservative health policy nostrums, and there's no sign of Trump's more maverick positions. Some political observers have said Trump doesn't really care much about policy details, and as president might well leave healthcare largely to Ryan and other GOP congressional leaders. As Michael Grunwald wrote in Politico Magazine Sunday, the Trump campaign has been lighter on policy proposals than any presidential campaign in modern memory. “It's unclear what would become the law of the land under Trump, and it's unclear whether his convention will make it clearer," Grunwald wrote. Healthcare leaders may just have to trust that whatever the healthcare problem is, Donald Trump will fix it. Or else he'll hand it off to Ryan.